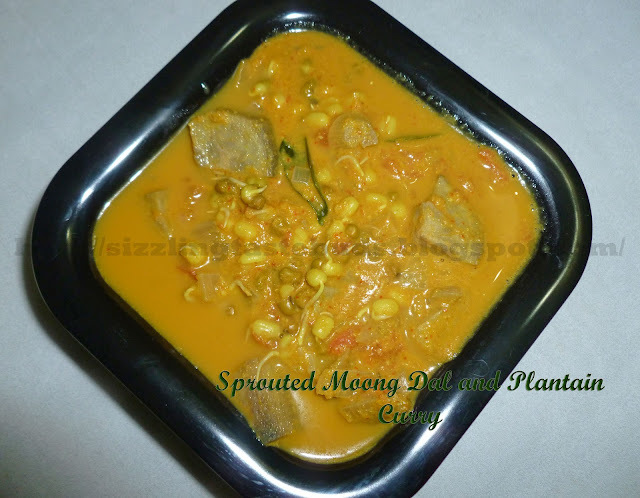 Sprouted Green gram and Plantain Curry is one the healthy and simple South Indian curry which goes very well with roti's, chapati, dosa's or even with hot rice. 1. Pressure cook sprouted moong dal, chopped tomatoes, plantain and onions with little water. One whistle would be fine. 2. Slightly dry roast grated coconut, red chillies and dhania seeds one by one and keep aside. 3. Blend garlic cloves, roasted red chillies, corainder seeds and coconut to a fine paste. 4. Add this paste to the pressure cooked moong dal and plantain mixture and cook it to get a boil. 5. Throw in some fresh curry leaves and haldi while boiling and pour some water depending on your desirable curry consistency. Add salt to taste. 6. Simmer the flame and cook it for 5-6 mins . Enjoy it with Hot rice, Dosa's, Idli's or even chapati's.